This article deals with alternative antibiotics to penicillin in case of penicillin allergy. We first describe the main symptoms of penicillin allergy and then suggest alternative non-penicillin antibiotics. 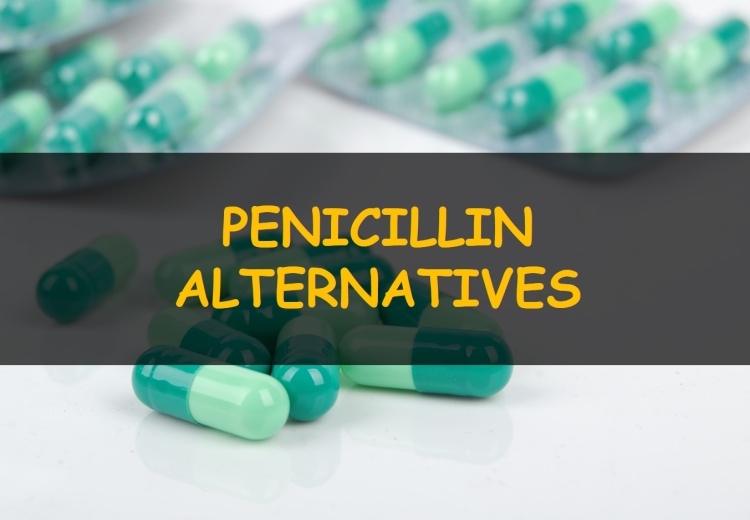 Narrow spectrum penicillins: Penicillin G and penicillin V are the typical examples of narrow spectrum antibiotics that have antibiotic coverage against gram negative cocci, gram positive cocci, gram positive rods and spirochetes. Very narrow spectrum pencillinase resistant drugs: These antibiotics are used for resistant strains of staphylococci. Examples include naficillin and oxacillin. Wide spectrum antibiotics: Ampicillin, amoxicillin, piperacillin and ticarcillin are the examples of wide spectrum antibiotics. Apart from coverage against gram positive organism, these wide spectrum drugs are also active against gram negative rods too including Listeria monocytgenes, Escherichia coli, Proteus mirabilis, Haemophilus influenzae, Klebsiella, pseudomonas and Enterobacter species. Despite the fewer chances of side effects, 10 percent people do suffer from penicillin allergy. However, anaphylactic allergy or shock occurs only in rare cases. Penicillin allergy is more likely to occur in those people suffering from allergy conditions like urticaria and asthma. Penicillin allergy occurs when the body’s immune system shows overreacted response against penicillin antibiotics. In people who are prone to penicillin allergy, their immune system considers penicillin as an intruder or harmful substance and launches an immune reaction against it. Antibodies are formed against the penicillin antibiotics. These antibiotics then activate those cells that are involved in the release of allergy mediators like histamine. Allergic person may not complain of allergic symptoms on first time intake of penicillin antibiotic because the level of antibodies produced at first exposure are not enough to launch a full fledge allergic reaction. However, on repeated exposure there is production of more and more antibodies that tend to stimulate the release of allergy mediators. This ultimately ends up in initiation of allergic reactions (1). Sometimes, penicillin allergies are over reported because they are confused with side effects of the drug. This leads to misdiagnosis and use of inappropriate antibiotics for treating patient’s condition that are less effective. Thus, the diagnosis of penicillin allergy cannot be made alone on the basis of signs and symptoms because mild allergic reactions often mimic the side effects of drug. So,in order to establish the diagnosis of penicillin allergy, skin allergy test should be done on patients who complain of allergy to penicillin. A positive skin test is an indicative of penicillin allergy. Those who are allergic to one penicillin antibiotic for example penicillin G, they also show hypersensitivity to other penicillin drugs as well. Therefore, all sort of penicillin antibiotics should be avoided in patients with penicillin allergy. If anything mentioned above happens to you after taking penicillin, immediately seek medical help from nearby poison centre or hospital to get proper treatment in time. Mile allergic reactions can be controlled well with the help of antihistamine drugs but, anaphylaxis is a medical emergency that needs to be corrected through epinephrine injections. Penicillins are the bactericidal drugs that inhibit the cell wall synthesis in bacterial cells. All bacteria need a shielding cell wall for their survival in the body. But penicillin inhibits the formation of cell wall in bacteria that makes them vulnerable to body’s harsh environment. Once the bacteria lose their cell wall, they begin to die rapidly. But how it is possible? Penicillin binds to specific enzymes located in the cell wall of bacterial cells, known as penicillin binding proteins. This in turn inhibits the transpeptidation or cross linking reaction between peptidoglycans (the structural component of bacterial cell wall) that is necessary in the synthesis of cell wall. Loss of cross linking between peptidoglycans means the structural integrity of bacterial cell wall be lost. Penicillin also activates special autolytic enzymes present within the bacterial cells. As the name is indicating, these enzymes start killing and engulfing the cells causing their autolysis. All these activities of penicillin work side by side to inhibit bacterial growth. But, now the resistant strains of bacteria are emerging that show resistance to penicillin. Examples are resistant staphylococci and gram negative bacteria. These bacteria produce penicillin destroying enzymes called beta lactamases and penicillinases. Beta lactamase producing bacteria cane be killed by adding inhibitors of beta lactamases like clavulanic acid, sulbactam and tazobactam to penicillin antibiotics. Another mechanism through which bacteria resist penicillin is the alteration in the structure of penicillin binding protein. These structurally altered proteins have less affinity for penicillin that affords resistance to bacteria. Some bacteria develop efflux pumps in their cell wall. These efflux pumps throw back all the drug that enters the bacterial cell. Thus, all above mechanism are responsible for making bacteria resistant to penicillin action. First generation cephalosporins: Examples of first generation cephalosporins are cefazolin and cephalexin. These antibiotics are used as penicillin G substitute. They provide antibiotic coverage against gram positive cocci (staphylococcus aureus, staphylococcus epidermidis, streptococcus pneumonia, streptococcus pyogenes, and anaerobic streptococci) and gram negative rods (Escherichia coli, Klebsiella pneumonia, Proteus mirabilis). Second generation cephalosporins: These cephalosporins show more activity against gram negative bacteria. Examples of this sub group are cefotetan, cefotixin, cefuroxime and cefaclor. The antibiotic coverage is similar to first generation drugs with an additional coverage to gram negative cocci (Neisseria gonorrhoae), gram negative rods (Enterobacter, Escherichia coli, Haemophilus influenzae, Klebsiella, Proteus mirabilis) and Bacteroides fragilis. Third generation cephalosporins: Examples are cefatzidime, ceftriaxone and cefotaxime. The antibiotic spectrum is almost similar to second generation drug with increased activity against those gram negative bacteria that are resistant to other beta lactam drugs. Fourth generation cephalosporins: Cefepime is the fourth generation cephalosporin that is active against most of the gram positive and gram negative bacteria that show resistance to other cephalosporins. Mechanism of cephalosporins: Mechanism of action of cephalosporin is similar to penicillin. They inhibit the cell wall synthesis by binding to penicillin binding proteins and blocking the transpeptidation reaction of peptidoglycans. Structural differences of cephalosporins make them more resistant to beta lactamase producing bacteria but, many bacteria produce extended beta lactamases that can reduce the efficacy of cephalosporins. Carbapenems: Carbapenems are synthetic beta lactam drugs with structural differences from penicillins. This provides them with broad antibiotic spectrum, making them able to act against resistant strain of bacteria too. Example of carbepenems are imipenem, meropenem and doripenem. Carbapenems provide spectrum against gram positive cocci (including penicillin resistant strain), gram negative cocci, gram positive and negative rods, anaerobes and specially pseudomonas aeruginosa. Mechanism of carbapenems: Carbapenems acts in similar way to all other beta lactam drugs by inhibiting the cross linking reactions in the cell wall. However, due to their structural stability, they are less susceptible to the action of beta lactamases. Monobactams: Aztreonam is the example of monobactams that is more resistant to the action of beta lactamases. Aztreonam is effective against resistant species of gram negative rods including Klebsiella, pseudomonas and Serratia (4). However, this antibiotic does not show activity against gram positive bacteria and anaerobes. Mechanism of action is similar to other beta lactam drugs. Glycopeptides: Vancomycin is the typical example of glycopepetides. This drug inhibits the tranglycosylation step in cell wall synthesis, thus weakening the cell wall. Vancomycin is effective against resistant strains of gram positive cocci, gram positive bacilli, clostridium species and actinomyces. Its activity is more pronounced against penicillin resistant species of staphylococci. Drugs belonging to this class are the potent inhibitors of bacterial protein synthesis. Bacteria need to produce proteins in order to multiply and survive. Proteins act as the main control system of bacteria cells. When the protein synthesis is inhibited, the bacterial growth will be halted own its own. Bacterial cells need ribosomes, transfer RNA (t-RNA) and messenger RNA (m-RNA) for protein synthesis. All protein synthesis inhibitors bind to 50S ribosomal unit, except for tetracyclines which bind to 30S unit, and inhibit the coupling of m-RNA and t-RNA. When this coupling is inhibited, transpeptidation reaction is stopped between amino acids and protein chains are not synthesized. Lack of protein synthesis means the whole control system of bacterial cell will shut down, resulting in inhibited bacterial growth. Tetracyclines: Tetracyclines bind to 30S ribosomal unit and inhibit the bacterial protein synthesis. Examples are tetracycline, doxycycline, minocycline and tigecycline. Tertracyclines are broad spectrum antibiotics with an activity against a number of gram negative and gram positive bacteria as well as against Spirochetes, Chlamydia, Rickettsia, Mycoplasma pneumoniae and anerobes. Bacteria that show resistance to tetracylclines develop efflux pumps that pump back all the drug that enters the cell, reducing the intracellular concentration of the drug. Aminoglycosides: Aminoglycosides enter the bacteria cells through special channels or porins located with the outer membrane of bacterial cells. After entering the cell, these aminoglycosides drugs bind 30s ribosomal unit and inhibit the synthesis of protein chains. Drugs belonging to this subgroup are gentamicin, tobramycin, streptomycin, amikacin and neomycin. Amiglycosides are aerobic gram negative rods including brucella species, Francisella tularensis, Klebsiella species, pseudomonas aeruginosa, haemophilus influenzae, Moraxella catarrhalis, shigella, enterobacter and Yersinia pestis. They are also effective against gram positive bacteria including enterococcus species. Resistance to aminoglycosides is either due to reduced uptake of drug or production of enzymes that destroy the drug. Activity of aminoglycosides is enhanced when they are used in combination with penicillin. Penicillin tend to weaken the cell wall which improves the penetrating ability of aminoglycosides in the cell. However, these drugs can cause some serious side effects like nephrotoxicity, ototoxicity and paralysis. Due the high risk of these side effects, aminoglycosides are not considered to be the choice of drugs and have been replaced by safer drugs. Macrolides: Macrolides are called so because their structure contains a macrocylcic lactone ring that bestows them with anti microbial properties. Examples of macrolides are erythromycin, clarithromycin and azithromycin. Like other protein synthesis inhibitors, macrolides bind 50S ribosomal unit, block the transpeptidation reaction and inhibit the protein chain synthesis. Erythromycin is the drug of choice for those suffering from penicillin allergy as it has antibiotic spectrum quite similar to penicillin. It shows anti biotic activity against gram positive cocci, gram negative cocci, gram positive bacilli (speciall corynebacterium diphtheria), gram negative rods, Chlamydia species, mycoplasma and legionella. Clarithromycin and azithromycin have antibiotic similar to that of erythromycin with an additional activity against haemophilus influenzae, Moraxella, Chlamydia, Mycobacterium avium complex and toxoplasma. Macrolides are good option for someone having trouble time with penicillin allergy. However, bacteria are now becoming resistant to macrolides as well. The main mechanisms through which bacteria show resistance to macrolides include development of efflux pumps, decreased affinity for 50S ribosomal unit and production of macrolide destroying enzymes called esterases. However, if someone develops resistance to these macrolides, then other antibiotics with broad spectrum coverage can be chosen (5). Chloramphenicol: Chloramphenicol has its unique structure and properties that differentiate it from other antibiotic groups. Due to its unique nature, this antibiotic cannot be placed in any other sub group of protein synthesis inhibitors. Chloramphenicol has got a wide spectrum against a number of gram positive and gram negative bacteria with more activity against Haemophilus influenzae, Neisseria meningtidis, Rickettsia and bacteroides. Chlorampehnicol is used for treating serious salmonella infections, pneumococcal meningitis, rickettsial diseases and infections caused by Bacteroides species. However, a number of serious side effects can occur with chloramphenicol use like aplastic anemia and grey baby syndrome (characterized by reduced blood cells, cardiovascular problems and cyanosis in neonates). Due to the high risk of adverse effects chloramphenicol is used only to treat serious infections that did not respond to other antibiotics. The mechanism of action of chloramphenicol is similar to other protein synthesis inhibitors. It binds to 50s ribosomal unit and block the formation of amino acid chains. Resistance to chloramphenicol is mediated through the production of acetyltransferase that reduce the drug efficacy by causing its destruction. Clindamycin: Clindamycin works in the same way as other protein synthesis inhibitors work. Clindamycin is more effective against anaerobic bacteria such as Bacteroides fragilis. It also shows antibitiocs activity against resistant species of gram positive cocci, especially the community acquired resistant strains of staphylococcus aureus that show high resistance towards penicillin antibiotics. But, the use of this drug must be avoided in patients with impaired renal or hepatic functions because clindamycin accumulates in the body of these patients and can cause allergic skin reaction to severe pseudomembranous colitis caused by super infection with clostridium difficile. Streptogramins: Quinupristin-dalfoprostin is a combination of two streptogramins that tend to inhibit protein synthesis. The use of these antibiotics is reserved only for treating vancomycin resistant strain of staphylococci. As these are narrow spectrum antibiotics, they are used for treating only limited number of infections. Fluoroquinolones are a separate group of drugs with a very wide spectrum of antibiotic activity. These antibiotics work in a different way as compared to other antibiotic groups. Fluoroquinolones enter the bacterial cells either through passive diffusion or through special channels called porins. Once they gain entry in the cell, they target two enzymes known as topoisomerase II and IV, the enzymes that are responsible for replication of bacterial DNA. When these crucial enzymes are inhibited through drug action, DNA replication stops. Stopping the bacterial DNA replications means the bacterial cells will no longer be able to multiply or divide now, because DNA replication is necessary for cell division and bacterial growth. Norfloxacin is an example of first generation fluoroquinolones. First generation antibiotics have moderate activity against gram negative rods. However, they are not used very often today as better generations of fluoroquinolones have been developed. Drugs belonging to second generation are ciprofloxacin and ofloxacin. They have extended activity against gram negative rods with activity against gram positive cocci, Chlamydia and Mycoplasma as well. Ciprofloxacin is considered to be the drug of choice for treating urinary tract infections, typhoid and dysentery. Levofloxacin and gemifloxacin are third generation drugs with more marked activity against gram negative rods and gram positive cocci, especially the resistant strains of staphylococci and streptococcus pneumonia. These drugs are also labeled as respiratory fluoroquinolones. Moxifloxacin is the only drug of fourth generation with marked activity against gram positive cocci and rods, gram negative rods and anaerobes. Sulphonamides: Sulphonamides are the bacteriostatic inhibitors. They cause competitive inhibition of an enzyme named as Dihydropteroate synthetase that is involved in the synthesis of folic acid precursors. Thus by inhibiting the folic acid synthesis, sulphonamines block the DNA synthesis and bacterial growth. Sulphonamides are effective against gram positive and gram negative bacteria, including Chlamydia and Nocardia as well. Examples of sulphonamides are sulfectamide (used for ocular infections), sulfadiazine (used for burns) and sulfasalazine (used for ulcerative colitis and rheumatoid arthritis). Sulphamethoxazole is another sulphonamide that is used in combination with trimethoprim, another folate antagonist, to treat urinary tract infections and ear infection. This combination of drugs is also used for treating typhoid, shigellosis, nocardiosis and for infections caused by resistant strains of staphylococci and pneumocystis jiroveci. Trimethoprim: Trimethoprim is another folate antagonist that inhibits dihydrofolate reductase, an enzyme involved in folic acid synthesis. When this enzyme is stopped from working, there will be no folic acid synthesis and consequently no DNA synthesis and replication. Antibiotic spectrum of trimethoprim is quite similar to that of sulphonamides but trimethoprim is more potent. In most of the cases, these two drugs are used in conjugation because they have synergistic effect on each other’s activity. The point of whole article was to look for those antibiotics that can be used as alternatives in case of penicillin allergy. Fortunately, there are a number of antibiotics with broader spectrum and high efficacy that can be used as alternatives to penicillin. The chances of cross reactivity between penicillins and antibiotics of other groups are rare. Therefore, other antibiotics can be used safely in patients with history of penicillin allergy. However, the choice of alternative antibiotic depends upon the kind of infection that needs to be treated.